독일 Clicktronic사에서 새로 출시한 Metal housing Mini 3.5Stereo to 2RCA Y 인터케이블을 소개해 드립니다. 커넥터 타입은 3.5mm stereo plug/2xRCA plug로 되어 있으며, iPod 또는 iPone과 같은 스마트폰을 엠프 쪽 연결시에 유용한 음성 케이블 입니다. 또한, 고정밀 차폐의 풀메탈 커넥터를 채용하였습니다. 선재는 은도금 OFC 선재를 채용한 하이엔드 케이블입니다. 신치 잭 어댑터로 여러 MP3 플레이어, 스마트폰, 랩톱 및 iPad를 HiFi 시스템에 연결할 수 있습니다. 완전히 커버되는 다중 신호 차폐, 최고순도의 자재, 정밀한 제작 기술로 인해 몇 초 안에 음향 면에서 마음을 사로잡는 스테레오 오디오가 연결되며, 즐겨 듣는 음악을 거실로 불러들여 감상할 수 있습니다. The RCA-jack adapter allows to connect many MP3 Players, Smartphones, Laptops, and iPads to the HiFi system. 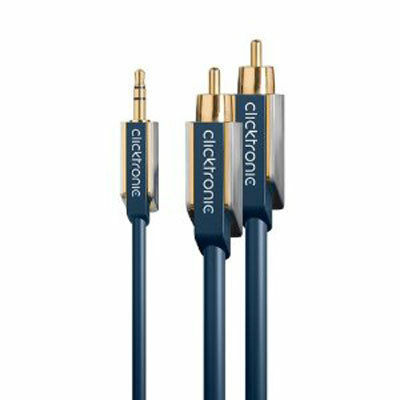 Due to full cover signal shielding, purest materials, and most precise workmanship the sonically captivating stereo audio connection is established within seconds - and you can enjoy your favorite music brought along in the living room.